This delicious salad topped with orange and miso dressing is simple and full of the taste of summer. Season the duck with Chinese five spice, salt and pepper. Place in a small oven-proof dish and add a glass of water. Place in an oven at 140 C for one and a half hours until the meat is soft and the skin is crispy. You can turn up the heat for a very crisp skin towards the end. Whisk all the ingredients together and reserve. Peel the cucumber in lengths until you reach the seeds, repeat all the way around and marinade in the sweet chilli sauce and white wine vinegar. Chop all the vegetables for a salad and mix with the cooked noodles. Dress and toss with half the dressing. Place on a plate. Pan fry the tiger prawns and season with Chinese five spice, salt and pepper. 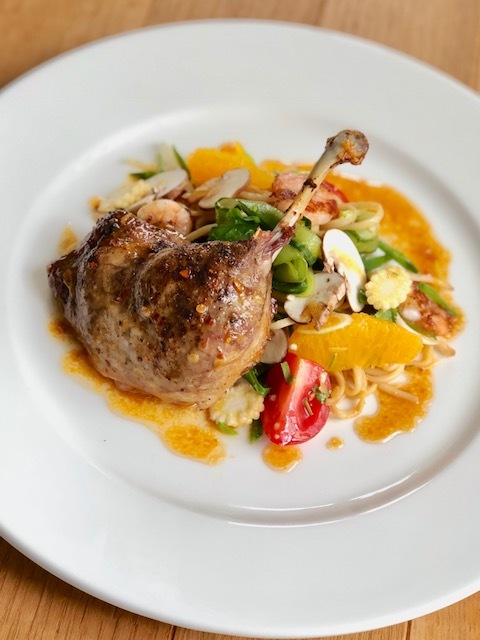 Arrange the prawns and duck onto the salad garnish with orange segments and coriander. Drizzle with the remaining dressing.